Though Southern California gives the impression of soft, off-shore breezes and bronzed sun-screened skin, the actual weather in the massive L.A. basin is quite parochial to its particular neighborhood. As such, the iconic Stadium-To-Sea race course will offer some measure of assistance in what promises to be a testing weather year at the 30th Asics Los Angeles Marathon. Beginning at Dodger Stadium near downtown, the temperature will be much warmer than along the ocean in Santa Monica where the athletes finish. But with temperatures expected to rise from near 70F at the start to high 80sF at mid-day, race officials have instituted hot-weather policies to help runners cope with the severe conditions, including starting the mass race a half-hour earlier, 6:55 a.m. vs. 7:25 a.m.
Three times in Asics L.A. Marathon history temperatures have risen to dangerous levels, none in the new course era (which began in 2010) — though a torrential downpour in 2011 caused its own havoc when calls went out for anyone named Noah. In 1993 on the old downtown loop course, the thermometer hit 86F at noon, but was a slightly less menacing 79F at the finish several hours earlier. Brazil’s Joselido Rocha won that race in 2:14:28, second slowest winning time in L.A. history. Number one on that infamy list came in another hot-weather year, 2007, when Kenya’s Fred Mogaka suffered through a 2:17:14 win on a day that began at 84F and finished at 76F. The other sweltering year was 2004 when David Kirui ran 2:13:41 to claim the top prize with temps topping out at 83F. 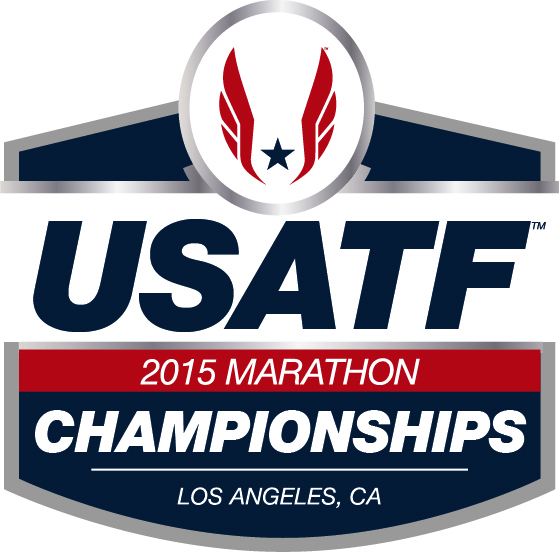 This year in anticipation of the 2016 U.S. Olympic Team Trials Marathons, the 2015 USATF Marathon Championships will be on the line in L.A. It will be interesting to see how the competition plays out, as there is a solid, but not frightening international field toeing the line as well. With high temps in the air, will the American contingent join up with the less frisky Kenyans and Ethiopians, or quickly form their own pack behind? Ryan Hall seems most in no-man’s land. If he is his old self and on form (PR, 2;04:58, Boston 2011) then he will no doubt race at the front. Even if he’s not quite 100%, he’s likely to front-run, as that has always been his M.O. Ryan is coming off a training stint with wife Sara in Ethiopia, which should hold him in decent stead for the warm, but dry conditions. Anyone who has ever been to Addis Ababa and Southern California always notes how similar the air temperature and humidity are, not forgetting that Addis sits at nearly 8000-feet altitude. What’s more, as anyone who follows the Halls knows, they compete for both personal and higher purposes. 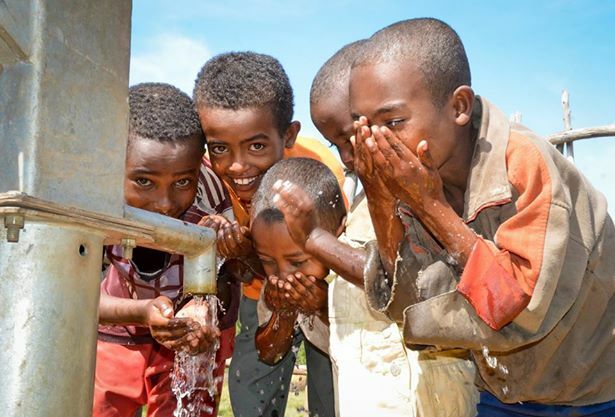 This year Ryan tweeted “A goal I have for the LA Marathon is giving clean water to 100 people in Ethiopia. For each one you fund, I will fund 1. Also, through their Hall Steps Foundation Ryan and Sara helped build a hospital in Kenya with 2X L.A. Marathon champion Wesley Korir. The racers Hall will encounter internationally include noted road racer Lani Rutto of Kenya, who looks to step up one place on the podium after finishing second in L.A. in 2014. His PR 2:10:48 came up just 11-seconds short of Ethiopian Gebo Burka’s winning time last year. He will battle once again with training partner and long-time road rival Allan Kiprono whose marathon PR, 2:09:38, came in finishing tenth last year in Frankfurt, Germany. Over 10Km on the roads Kiprono holds an 11-2 edge over Rutto. And his course record at Washington D.C.’s Cherry Blossom 10 Miler (45:15, 2012) suggests a faster marathon is possible in good conditions. But those will not be on hand this Sunday. 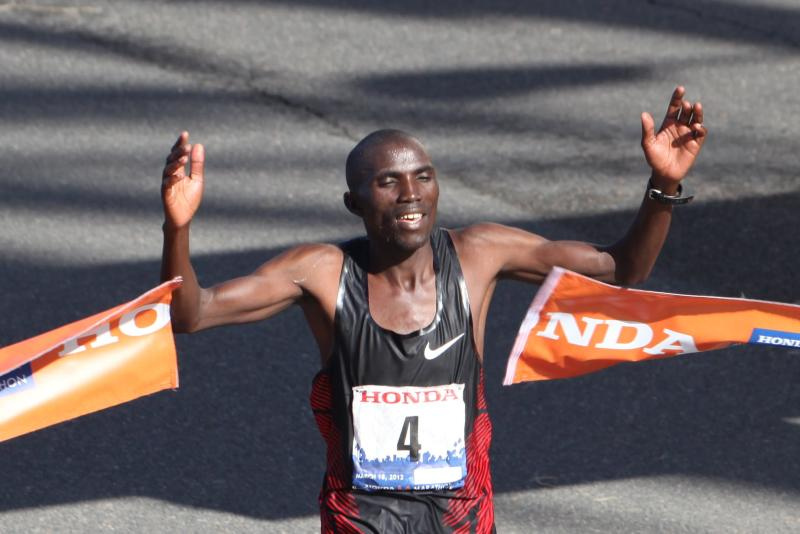 There will be ten East Africans racing in L.A., eight Kenyan, two Ethiopian. Included will be 2012 race champion Simon Njoroge who ran his PR 2:12:12 that day. David Kiyeng, 31, of Kenya holds the top PR in the field outside Ryan Hall’s 2:04:58 from Boston 2011. Kiyeng posted a 2:06:26 in Paris `09. Sounds motivated. Next best is Ethiopia’s Gezahagn Beyene, 31, who ran 2:07:41 in Marrakech 2013. Sahle Betona, also of Ethiopia, comes in with a 2:08:19 from Paris 2013, but then we drop to 2:08:39 from Kenyans Daniel Limo and 2:08:55 for Milton Kiplagat, 28, in Casablanca 2013. Milton had some problems (injury and former management) earlier in 2014, but ran a 2:10.48 in Ottawa in May, and is now fully recovered. He also won the Algiers Marathon on 01 November 2014 in a time of 2:09.04. The American contingent is headed by Hall, the enigmatic Big Bear, California native who hasn’t produced a Hall-quality marathon since the Olympic Trials in Houston in 2012 (2nd, 2:09:30). His last effort was a 2:17:50 in Boston last Patriot’s Day. On a brotherly omen note, Ryan’s younger brother Chad won last weekend’s San Diego Half Marathon. Taking measure of Hall will be Jared Ward, Sergio Reyes, Patrick Rizzo, Mike Morgan, and Matt Llano as they will vie for the U.S. title. 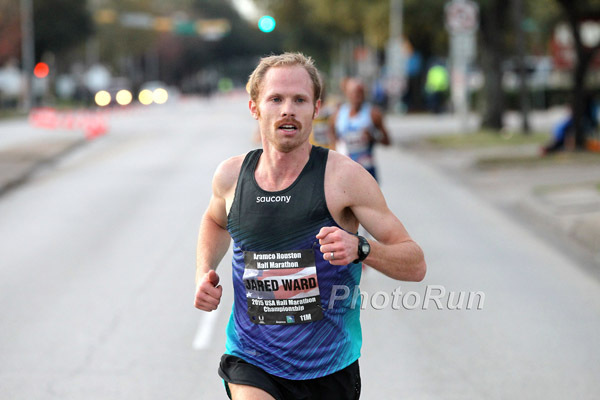 Jared Ward ran his debut in Twin Cities last fall, taking second to Tyler Pennel for the USATF National Marathon title. He is coached by his old BYU college mentor, Ed Eyestone, who will be unable to attend L.A. for the first time in decades as he will is in Fayetteville, Arkansas as the NCAA Indoors. However, Ed sent the following about his charge. That is the big difference between a spring and fall marathon. Anything unseasonable in the fall, and at least everyone has trained through the summer. But turn on the heat in the spring, and especially this year in the States, most have just come through brutal cold and snow. Fortunately, next year’s Trials in L.A. are in mid-February where the likeliest of poor weather would come in the form of precipitation. Matt Llano of Northern Arizona Elite comes to L.A. hoping his fading 2:17:43 in Chicago last fall, after being on 5-minute pace through 20 miles, will be a good lesson learned. The University of Richmond All-American has finished fifth at the Houston Half the last two years, this January in 1:02:22. Teammate Scott Smith, U.C. Santa Barbara grad, arrives in L.A. off a third place PR 2:14:40 at last fall’s Twin Cities Marathon USATF Championships where he aggressively posted a 4:50 20th mile to reshuffle the race deck. 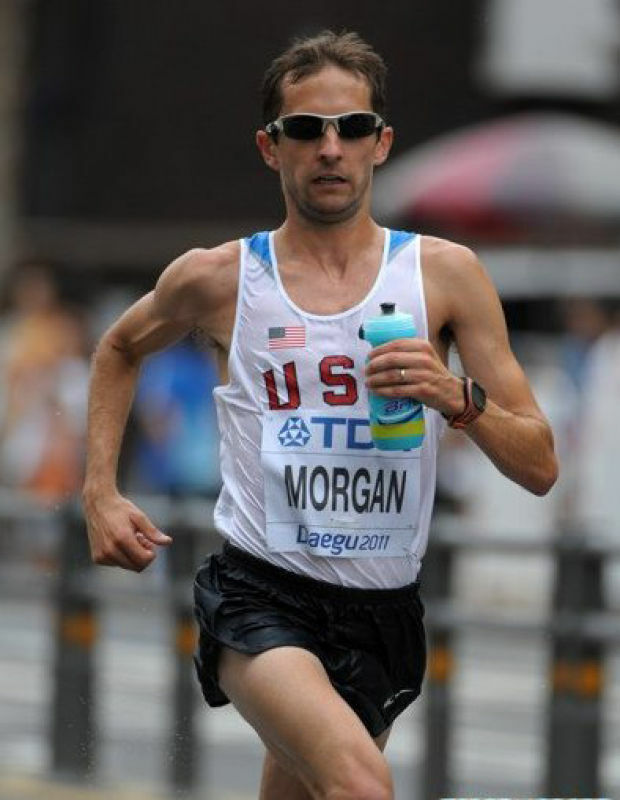 His marathon debut came in December of 2013 at the California International Marathon where he finished fourth in 2:16:04. Palmdale, California’s 2010 USATF Marathon champion Sergio Reyes of the Asics Aggies RC ran his PR, 2:13:34, at Twin Cities 2013, placing fourth. But only finished seventh there in 2:16:48 last year. Of course, he and his wife had just welcomed their new son into the world just two weeks earlier. He will probably have more sleep under him in L.A.
More updates, and a women’s preview after I arrive in Los Angeles. I must say you’ve done a superb job with this. In addition, the blog loads super quick for me on Firefox. This year, there was real rain on only one day in February (.7in rain for the day, the monthly total was .8in). The high broke 80F on six days, with the worst day 88. Thanks for that race review Toni, It’ll make the race that much more interesting. I’d like to make a shout out also to Sage Canaday who will be looking for an OQT in LA this weekend. Let’s hope it’s cooler than predicted. Good stuff Toni!! Now if only the weather was as cool as you are!! Pulling for Jared Ward. Great guy. Thanks, Larry. Cordially, back at ya. ASICS LA Marathon – Hot Weather Warning!